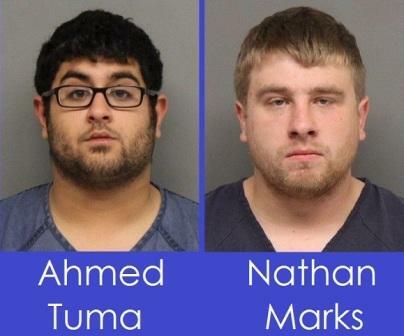 Lincoln Police arrested two men they say were involved in a hate crime Thursday evening. It happened around 5 p.m. near 27th & M Streets in Lincoln. Police say 20-yr-old Ahmed Tuma was angry with his sister because she is in a relationship with a woman. Police say Tuma said it is shameful to their family and against Muslim beliefs. Police say Tuma’s sister and her fiancee arrived at home near 27th & M when he and a friend, 20-year-old Nathan Marks ran up to them. Police say Tuma tried to hit her with a crow bar. The couple escaped into their car, but police say Tuma repeatedly hit the car with the crowbar. “They were in fear for their lives, he had made some verbal threats to kill the sister,” Officer Katie Flood with the Lincoln Police Dept. said. Police say the couple drove off, but Marks and Tuma got into Marks’ pickup and followed, ramming them from behind nearly into oncoming traffic on S. 27th Street. The couple were able to get away and call police. Tuma was arrested for attempted 2nd degree assault, criminal mischief, two counts of terroristic threats and use of a weapon to commit a felony. All of the charges except use of a weapon carry a hate crime enhancement. By the way, not that I feel any pain for the lesbionic Muslim chick. I guarantee you that, like the rest of her fellow co-religionists in the Rainbow Jihad, she still hates Israel, Jews, and so on. But she does like the WNBA and sensible shoes, so it’s all good, right? Can’t wait for the movie. Fatima and Louise. First off, thank goodness that Lincoln, NE authorities arrested these two low-lives, because the muslim dude’s sister happens to be a lesbian and is into other women. Secondly, as Debbie elaborated at the end of the piece, I really wouldn’t be surprised if the lesbian muslim girl is an anti-Semite (a good number of muslims are vehement anti-semites), shows empathy & hatred for this country, the western world and the state of Israel? I gotta say, judging from these Booking photos, somebody’s been peeing in the Gene-pool ..
Not that It matters, but was she a Hezbian? Maybe if the Moslems and the fags start killing each other, two problems will be taken care of. Unbelievable. Every Islamic atrocity I read about seems to outdo the previous one. And who is this Nathan Marks, enabler of the crime? Et tu, Nebraska? This attack underscores once more how the Hannity/O’Reilly/Malkin line about virtuous, traditional “Red State” Americans (as opposed to “liberals”) is an illusion, a money-making hustle. Where’s the jihad against camel and goat love? They never bring that up. Muslim gay men try to “Honor kill” lesbian sister and girlfriend- ” News at 6 PM” — GOOGLE web Analytics shows highest look ups of gay male websites come from Pakistan. Why weren’t they charged with attempted murder? They intended to beat them to death with a crow bar and they tried to push the two women into oncoming traffic to kill them. They should be charged with attempted murder of the two lesbos as well as of the operators of the oncoming cars. It’s long over do for an Infidel uprising right here in the good ole USofA, as far as I’m concerned. 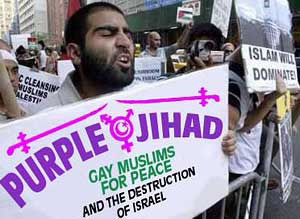 Gay Muslims for peace and the destruction of Israel. Interesting but key demographic. Has anyone from either political party done any research concerning reaching out to this group? I mean a vote is a vote, right? I can’t wait for Satanists for Jesus to demand that their voice be heard. The perpetrators look like the products of excessive inbreeding. See? You brought up the WNBA, and now we have to notice that it still exists. If everyone would just not mention it, maybe it’ll just run out of steam and our long national nightmare will be over (I know this has nothing to do with lesbians being attacked with crowbars by ugly young men). I judge the quality of a woman’s sport by this simple criteria: the woman’s sport is meaningful if the very best females in it can beat an average high school male. So, women’s track and field, OK. Women’s golf, tennis, racketball, etc. OK. Women’s soccer? Probably. I think the US National Team can take some middling high school boy’s team. Women’s basketball? Not so much. And they use a smaller ball. I have no confidence that the current WNBA champions can beat the boy’s starting five from Anytown High, presently sitting with a 10-10 record in league play. Make it Fatima & Aisha – so that you get lesbionic AND pedophilic activities. One is haram and the other not.